When an image is place two images are auto-created. The Foreground image is the one you rip and the Background one is where the ripped image is placed. 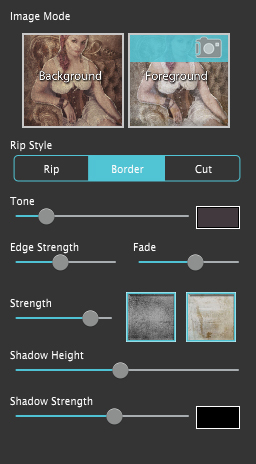 Adjust the worn texture effect on these two images by toggling between the under Image Mode. Rip out the subject by circling it with the Lasso Rip tool then resize it for added focus using the Move Image tool. Please note, the background image is always static and cannot be removed. Use two images for a simple collage. First create the project by dragging the background image on the open application. A background and foreground image will be created. To replace the Foreground image use the Camera Icon; or drag a new photo into the foreground box. Rip out the image then adjust the texture and paper by toggling between background and foreground. Original Button - Hold down to view the original image for a quick comparison. Pans around your document. Works especially good when zoomed in. Space Bar on your keyboard gives quick access to this feature. You can use the Adjust Tab to customize your image. Background - Select this to change the settings on the background image. Note, the background image is static and cannot be removed. Foreground - Select this to change the settings on the foreground image. Replace the image using the camera icon on the blue bar, or drag and drop a new photo onto this box. Tone - Use the color box to choose a color to tone the image. Move slider right to increase tone strength. Edge Strength - Creates a textured vignette around both the foreground and background image. Use the slider to adjust the opacity. Texture Box - Select the box to bring up a library of textures. Mix this with papers for different looks. Paper Box - Select the box to bring up a library of papers. Mix this with textures for different looks. Shadow Height - Changes the height of the shadow giving the appearance of being higher off the other image or lower. Once you have applied a preset and modified it using the Adjust Tab, you can save your own custom preset by clicking the plus symbol in the bottom right corner. To delete a preset click the minus symbol which is located in the bottom right corner. Then click the X on the preset you wish to delete.